USPA NEWS - The Name of the Café “LES DEUX MAGOTS” (“Two Chinese Figurines”) comes from a Novelty Shop that once occupied the Same Premises. Founded in 1812 at 23 Rue de Buci, it was transferred to Place St-Germain-des-Prés to expand in 1873. The Two Statues that adorn the Café now stand as Witnesses to that Era. In 1885, the Shop gave way to an Alcohol-Serving Café that kept the same name. Verlaine, Rimbaud and Mallarmé, to name a few, were Regulars at the Café. The Café began to play an Important Role in Parisian Cultural Life before asserting its Literary Vocation in 1933 with the Creation of the "Prix des Deux Magots Award". The Name of the Café “LES DEUX MAGOTS” (“Two Chinese Figurines”) comes from a Novelty Shop that once occupied the Same Premises. Founded in 1812 at 23 Rue de Buci, it was transferred to Place St-Germain-des-Prés to expand in 1873. The Two Statues that adorn the Café now stand as Witnesses to that Era. In 1885, the Shop gave way to an Alcohol-Serving Café that kept the same name. Verlaine, Rimbaud and Mallarmé, to name a few, were Regulars at the Café. The Café began to play an Important Role in Parisian Cultural Life before asserting its Literary Vocation in 1933 with the Creation of the "Prix des Deux Magots Award". Frequented by Numerous Famed Artists including Elsa Triolet, Louis Aragon, André Gide, Jean Giraudoux, Picasso, Fernand Léger, Prévert, Hemingway and others, the Café hosted Surrealists under the Aegis of André Breton, and Existentialists around Sartre and Beauvoir. Today, as Popular as Ever, one of the Oldest Cafés in Paris attracts Personalities from the World of the Arts and Literature, Fashion and Politics, and Tourists from around the World. Created in 1933 as an Alternative to the "Prix Goncourt", considered Too Academic, the "Prix des Deux Magots" was First Awarded to a Unknown Young Author... Raymond Queneau for his Book "Le Chiendent" (“The Bark Tree”). Ever since, the "Prix des Deux Magots" kicks off the Literary Year in the Month of January. It draws Attention to Quality Writers, presenting a Selection of Diversified and Unconventional Writers such as Antoine Blondin, Marc Dugain, Michel Crépu, Jean-Claude Pirotte, Daniel Rondeau, Eve de Castro, Olivier Séchan, Fernand Pouillon and more. The Last Winner (January 2019) was Emmanuel de Waresquiel for his Book " Le Temps de s'en Apercevoir". Other Types of Artistic Expression are also honoured at "Les Deux Magots" : "The Pelléas Prize" recognises a Music-Themed Literary Work ; "The Saint Germain Prize", in Partnership with the "Brasserie Lipp", "The Flore Café" and Sonia Rykiel, has celebrated an Artist in Various Disciplines for many years (Architecture, Cinema, Theatre, Art, Fashion...). Anyway, it ranks among the Most Famous Cafes in Paris. "Les Deux Magots", in a Beautiful Location on Place Saint Germain des Pres, has a Rich Cultural and Historical Background. Many Parisian Brasseries content themselves with serving Re-Heated Industrial Dishes, often of Mediocre Quality. Here, Deep-Frozen Dishes are banished from the Menu, with the Mathivat Family, Owners of the Establishement for a Century, it offers Traditional French Cuisine, Self-Evidently "Homemade", Fresh and Tasty. (prepared Right in the Restaurant's Kitchen, with Fresh Ingredients, Short Supply Chain, and Yotal Tracebility). 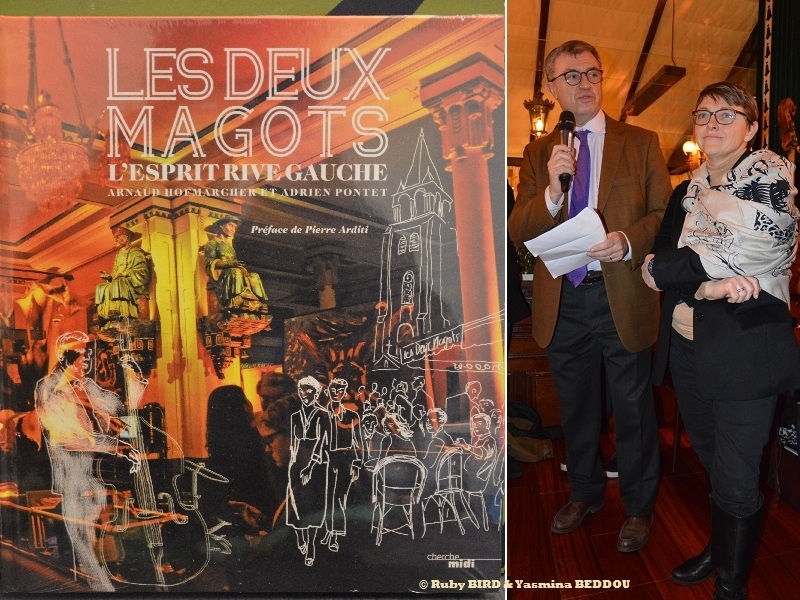 On January 21, 2019 was held at "Les Deux Magots", the Book Launch "LES DEUX MAGOTS - L'ESPRIT RIVE GAUCHE", written by Arnaud Hofmarcher & Adrien Ponter, prefaced by the Famous Actor Pierre Arditi. Published by Cherche-Midi Editions.... 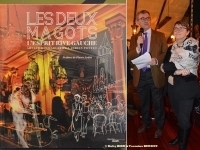 The Book was presented by The Owner of "Les Deux Magots", Catherine Mathivat of the Mathivat Family "The Establishment known to all for many years has benn reborn. Its Transformation aims to preserve its Authenticity and History while embracing the Future with Innovative Little Touches : Embellishments, Personalization, Changes to the Menus, a Year-Round Programme of Events...."